Vancouver has long been at the forefront of the food truck scene in Canada and has been named one of the top three food cart cities in North America. So it’s really no surprise that numerous festivals throughout the city advertise a heavy food truck presence. But it was only last year that a full on Food Cart Fest was organized, running every weekend throughout the summer. Last year’s version was held in the parking lot of the storied Waldorf Hotel in East Van. 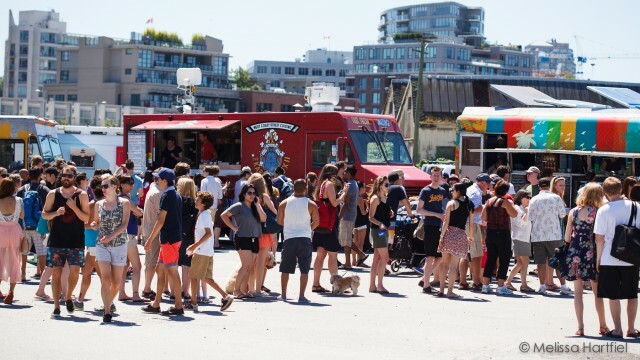 This year, the festival has moved to a larger space in the Olympic Village neighbourhood (West 1st) and runs every Sunday until Sept 22nd with over 20 food trucks participating. It’s a quick walk from Olympic Village Skytrain station or from the buses running along Main Street. Other notable differences this year? Well, there’s a $2 admission fee ($5 for families) and definitely more space. The festival is still lacking in shade and places to sit and there are long lineups everywhere – both to get in and to order from any of the trucks. 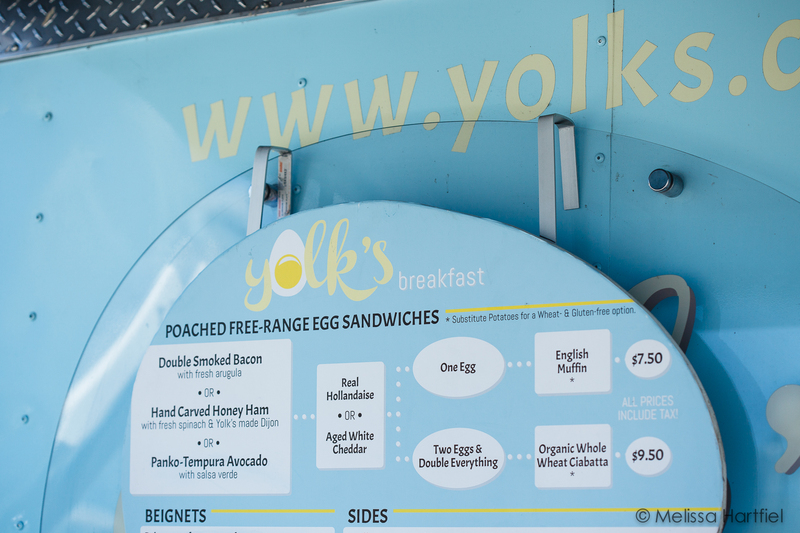 For my first sampling of the day, I decided to try Yolks, a truck I’ve seen many times on the street but have never tried. What sold me? 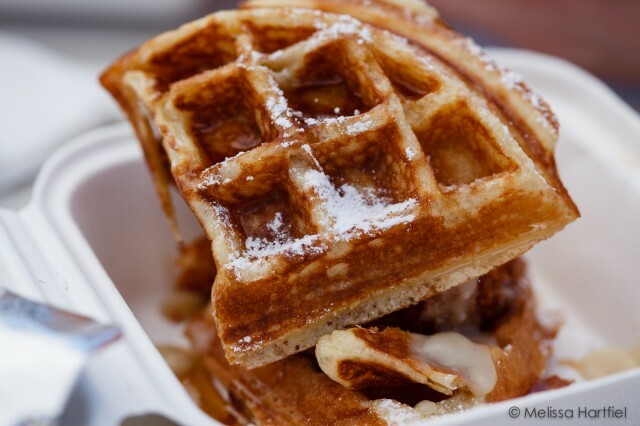 Chicken and waffles – a duo I’ve (gasp!!) never had before. The truck is one of the cuter ones out on the Vancouver scene and they serve a nice variety of poached egg sandwiches, fresh pressed juices and sides. The food was ok. I like my waffles and potatoes crispier and I found the chicken and gravy to be rather bland. The spicy ketchup was awesome though! One of my companions had the same as me and another tried one of Yolks egg sandwiches. 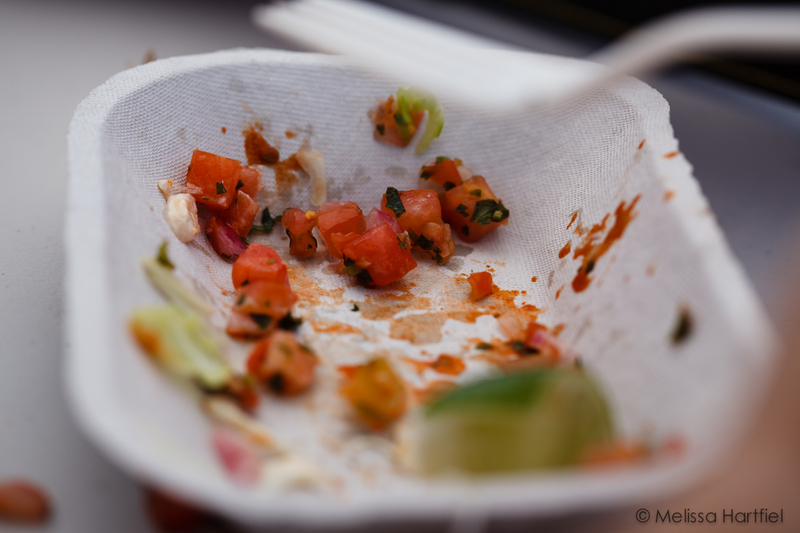 One of the other members of our group tried a fish taco from Tacofino and you can see the remains below. Also on the menu for the final member of our group was jerk chicken poutine from The Reef and a wrap from Soho Road. We were all a little disappointed in our food. Being that we’re all big fans of many of the trucks in Vancouver this was a little bit of a let down. Tacofino and Soho Road are two of my favourite food trucks in Vancouver! Our only conclusion was that with so many people to serve in such a short time, the quality of the food suffered. The lineups were much bigger than you see on the streets at lunchtime. One “new to us” vendor was Johnny Pops! Loaded with fresh fruit and some unique flavour combinations, this was one was a winner to all of us. 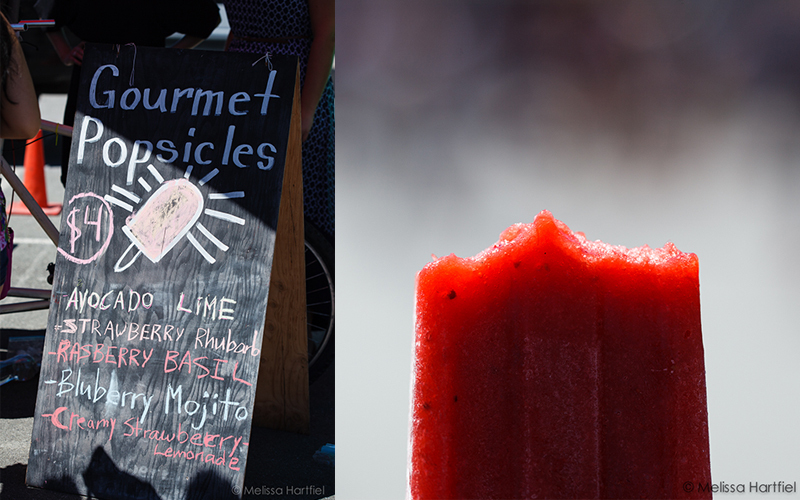 And on a hot day, they totally hit the spot. 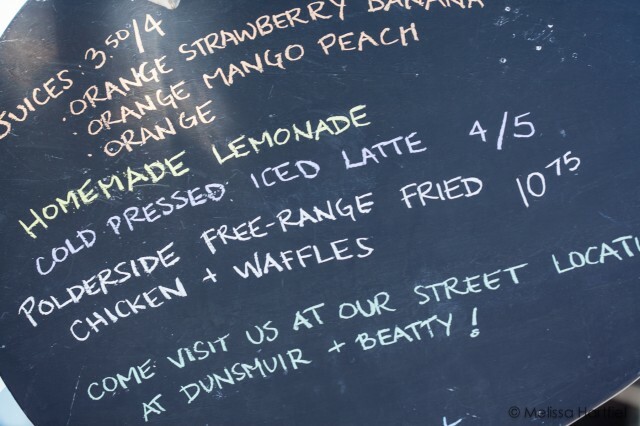 I had the strawberry rhubarb and it was delicious and full of fruit! Here you can see the lineups. Not a lot of fun in all that hot summer sun. I can’t imagine how people could have brought their dogs, knowing my own floppy muppet would have been suffering on that hot pavement. I really hope that the organizers do something to create more shade or shelter. It’s either sunny or raining in Vancouver and either way, nobody wants to stand for 30-40 minutes in hot sun or pouring rain. I have no idea how to alleviate the lineup situation but it’s not a lot of fun and after doing it two years in a row, I think that this will be my last food cart festival. So, my advice? 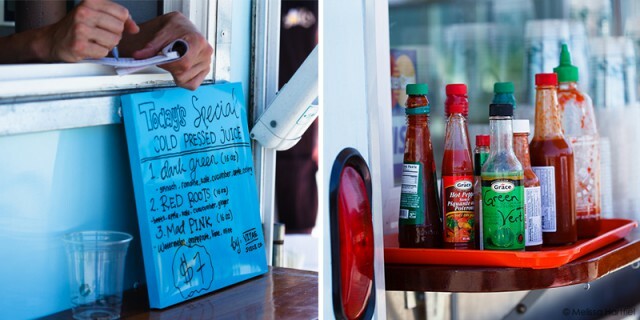 Skip the festival and hit up these trucks in their native environments on the streets of Vancouver. You’ll have a much more enjoyable experience with much better food! And if you see Johnny Pops along the seawall, stop and get yourself a popcicle and feel like a little kid for a few minutes! I totally agree! 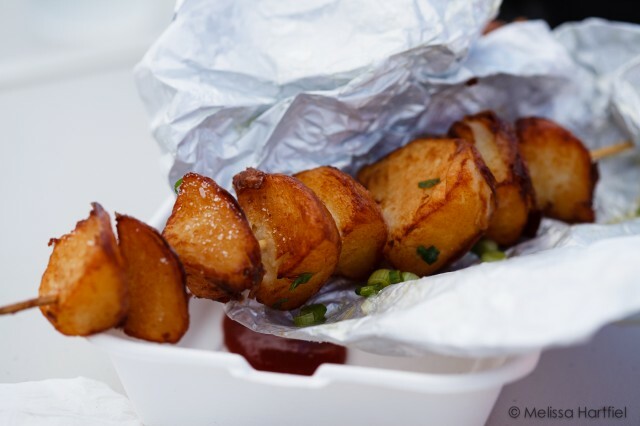 I’ve been to some of the food truck events in Calgary and they are always packed and hot. Your best bet is definitely to track down the trucks in action.